Grush is a Gaming Toothbrush That Turns Brushing Into a Game | OhGizmo! By Hazel Chua on 04/21/14 • Leave a comment! Kids are sometimes unaware of the importance of brushing at least thrice a day until it’s too late. Cavities, gum disease, bad breath–you name it and you’ll get it if you don’t brush regularly and practice good oral hygiene. You’re past that age of ignorance and unawareness, but your kid probably isn’t. So if little Junior ain’t brushing like he’s supposed to, then here’s something to convince him otherwise: Grush, which is a smart toothbrush system that turns brushing into a game. 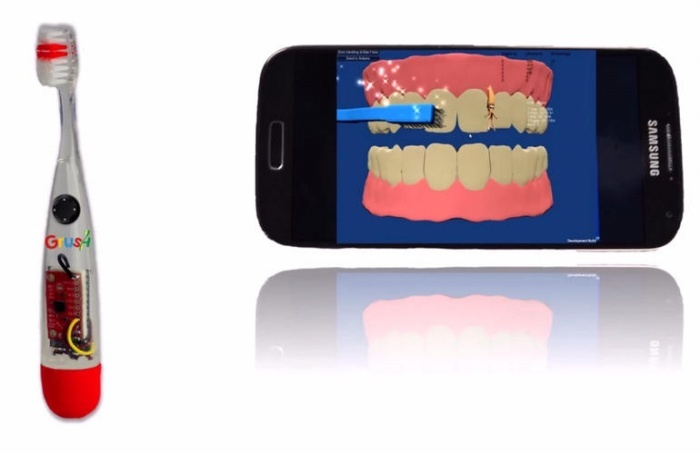 The toothbrush hooks up with an app that displays a virtual set of teeth. Brush for the minimum required amount of time and the monsters that lurk in that certain area will gradually disappear on the screen. Grush is currently up for funding on Indiegogo, where a minimum pledge of $49 will get you a complete Grush smart toothbrush system.